Like Perez Hilton said, if this doesn't kill the pregnancy rumors, I don't know what will. 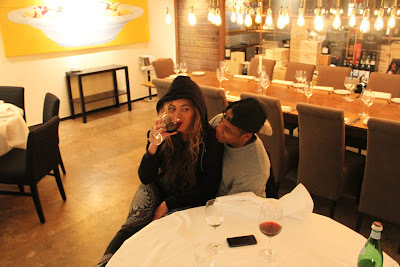 Beyoncé recently posted photos on her official site of her and Jay-Z enjoying themselves in a beautiful restaurant at a disclosed location (presumedly in Berlin, as graffiti art in another photo suggests), which includes a shot of her sitting on Jay-Z's lap while sipping on a glass of Barolo wine (above). As what is considered to be "common knowledge," drinking alcohol while pregnant could have negative effects on the child and expecting mother, which would put a huge damper on the engrossing rumor that Beyoncé is pregnant with her second child. Jay-Z denied the rumor earlier this month, but many people on the blogosphere were still skeptical. Let's just say that there's no more room for skepticism.